This painting was completed the year after Pissarro permanently relocated to France. The subject depicts two women walking along a seaside path in St. Thomas, the Caribbean island where he was born. The purple hills that extend from the left middle frame downward toward the ocean act as a dividing line in the background, demonstrating Pissarro's ability to merge the local color of the Caribbean with the gentle color palette of the Barbizon School, the group of French painters who first stressed the necessity of painting landscapes outdoors. Here, the tutelage Pissarro obtained on direct observation in his early studies in Paris allowed him to capture the effects of local, tropical light on an outdoor scene, prefiguring his future as a pivotal member of the Impressionist circle. Pointoise was Pissarro's intermittent home northwest of Paris from 1866 to 1883, where he received and mentored Cézanne and Gauguin, among others. Gauguin famously painted his early Pissarro's Garden, Pontoise while staying with Pissarro in 1881. Jalais Hill, Pontoise was lauded by the French author and cultural critic Emile Zola as an exemplary modern landscape depicting a "rare poem of life and strength" following its exhibition in the Salon of 1868. "This little valley, this hill have a heroic simplicity and forthrightness. Nothing would be more banal were it not so grand," Zola wrote of the manner in which Pissarro handled his rural subject matter. Indeed, the positive reception of the painting by critics and writers positioned Pissarro as an avant-garde painter in the second half of the 19th century, though he would soon turn his back on the Salon entirely, choosing to exhibit with the "Independent" Impressionists. For a time in 1869, Pissarro settled in Louveciennes, a rural suburb approximately 12 miles west of Paris. It was during this time period that Pissarro developed his mature Impressionist style, which reached its height in the mid-1870s. In this early Impressionist effort, Pissarro captures a fleeting sensation of the winter season, constructing his composition through the use of quick dashes of color. The long shadows cast on the new-fallen snow by passersby explore the atmospheric effects of cold winter light. The freshness and thickness of the brushstrokes, most easily identified in the trees' branches and the colorful garments of the townspeople, are the sort of constructive building blocks Pissarro would eventually pass down to Cézanne. The more smoothly distributed paint of the sky and the snow-covered ground demonstrate Pissarro's transformation of Realist naturalism into what would become the experimental, rough Impressionist aesthetic. More than a simple fellow traveler of the Impressionist movement, Pissarro was known by his artistic colleagues as a collaborator and mentor. Because of his willingness to allow younger artists to live with him for long periods of time to study and paint, and perhaps also due to his role as a family man and father of his own brood of eight children, he was affectionately referred to as "Pere Pissarro." In this iconic self-portrait, he depicts himself as a wise and respected paternal figure with his famous beard and his lively, observant eyes, looking much like a grandfather or old sage, despite being only 43 at the time. 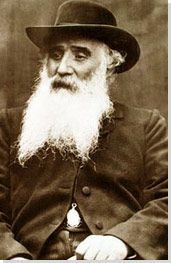 Indeed, Cézanne once wrote to his friend, the art dealer Ambroise Vollard, "As for old Pissarro, he was like a father to me. He was a man to be consulted, rather like God." Considered one of Pissarro's masterpieces, Hoar Frost is one of five paintings he exhibited at the first Impressionist exhibition in 1874. Here, a peasant worker traverses a field in Pissarro's hometown at the time, Pointoise. The painting's emphasis on color harmony is an important antecedent to Neo-Impressionist techniques, but his true achievement is bringing a focus on composition to the Impressionist canvas. Cézanne famously said "We must make of Impressionism something solid like the art of the museum" in reference to the movement's lack of underlying structure. Cézanne's mentor Pissarro, however, used tilled fields crossed with foot-trampled paths and regularly spaced trees on a horizon to create a balanced composition. The cool color palette and offset vanishing point fall comfortably into the rhythm of the canvas, directing the viewer's attention to the wandering figure. Pissarro's youngest daughter Jeanne-Rachel, nicknamed "Minette," died of tuberculosis at age eight after a short, sickly life. Though Pissarro painted portraits of his wife and children in great numbers, his matter-of-fact paintings of his daughter's slowly deteriorating health are among his most poignant. In this portrait, painted in the months preceding her death, Pissarro tellingly represents his daughter sitting inside near a heating stove rather than playing outdoors. She holds a Japanese fan: an object that at once suggests her own beauty, preciousness, and delicacy, as well as her father's love of Far Eastern art. Less an impression than a concrete representation of a loved one, Pissarro nonetheless incorporates some of the asymmetry of the Japanese woodblock prints that he and his Impressionist cohorts enjoyed into the composition of this painting, with the oddly angled chair and Minette's slightly off-center head tilt. After 1884, Pissarro settled in Eragny, a rural village three miles south of Pontoise that became the subject of hundreds of his paintings. In the 1880s, Pissarro acted as both student and mentor to the Neo-Impressionists Signac and Seurat, and Hay Harvest at Eragny (1887) shows the results of their collaborative experiments in tonal value and painting style. Notably, though several of the Impressionists grew away from the movement in the 1880s and beyond, Pissarro is the only one to move into the Neo-Impressionist style seen here. More than ever before, his short, dashed brushstrokes evince something akin to Pointillism, weaving together landscape and figure. Recalling the cloud sketches of British landscapist John Constable (1821-22) and prefiguring Monet's series of views of Rouen Cathedral (1892-93), Pissarro studied the effects of seasonal conditions on color, depicting the varying seasons and creating multiple paintings of the same subject at different points throughout the year. His painting is carefully structured by the semicircle of hay bales and the sharp diagonals of the workers' tools, which coax the eye to meander into the luminous fields in the distant background of the composition. While the clothing is that of the French countryside, the figures and their peaceful surroundings achieve a certain universality via the lack of recognizable landmarks and the anonymity with which Pissarro paints the peasants' facial features. A late manifestation of Pissarro's favorite theme, this painting depicts two young, female peasants taking a moment away from their work. Facing one another, the women are shown from an offset viewpoint that catches one in profile and the other from slightly above. The sky that takes up as much as a third of the canvas in his other landscapes is compressed into ten percent of the painted space, and the receding foreground is flattened to near two-dimensionality behind the closely positioned figures. This atypical angle shows the effects of Pissarro's experimental foray into printing, where, with Degas, he explored the dynamic compositional techniques of Japanese woodblock printmakers like Hokusai (1760-1849) and Hiroshige (1797-1858). Pissarro used these techniques here to emphasize the laborers' value in society at a time when France, and especially Paris, was rapidly industrializing and modernizing. In doing so, Pissarro spent his later life focused on presenting the pastoral values of a rural life that were being slowly overturned. Pissarro's career, which spanned nearly four decades in and around Paris, saw great changes in the makeup of the city. City planner Georges-Eugene Haussmann's renovation of the city (1853-70) broadened Paris's avenues, and the liberalization of Parisian labor laws during those years allowed for greater free time for the average citizen. As a devoted anarchist, Pissarro surely applauded this opening up of the everyman's creative leisure time. 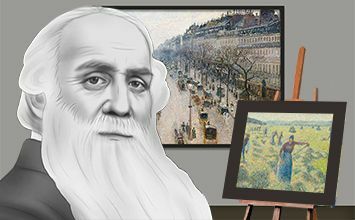 In this late-career hybrid of Pissarro's many artistic styles (Realism in its underlying composition and depiction of cloud formations; Impressionism in its snapshot quality; and Neo-Impressionism in its use of complementary colors to heighten visual sensation), he celebrates the city's modernity in one masterly canvas. On the main street in the neighborhood of Montmartre, a famed Impressionist haunt, Pissarro indicates a freedom of both physical and social mobility through his emphasis on the breadth of the street, the openness of the sky, and the bustle of the people and carriages that populate the City of Lights.